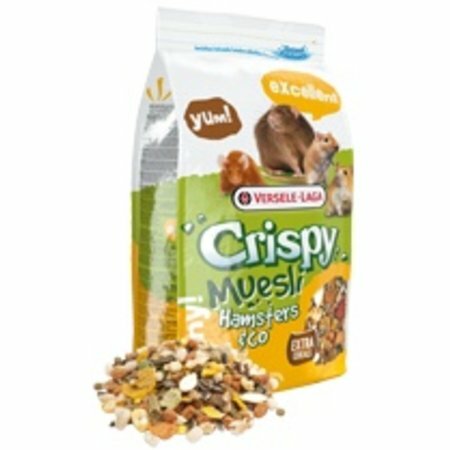 Versele-Laga Crispy Muesli Hamsters & Co. is a versatile rodent feed suitable for several small rodents. Thanks to the varied composition, this total feed offers everything your little rodent needs to stay in good condition and health. Hamsters and other small rodents will enjoy this tasty and versatile diet. The tasty and protein-rich Crispy Muesli Hamsters & Co. for hamsters and other omnivorous rodents is a complete diet. With delicious puffed grains, lots of vegetables and tasty nuts ... Really Sunny! A varied mix for gourmets. Thanks to the "Happy & Healthy" pellets, this Crispy Muesli contains all the nutrients your pet needs to live healthy and happy. The energy-rich composition also keeps the animals in top shape. Extra tasty for a good recording. Maximum freshness. We pack the food under protective atmosphere in special Freshpack foil. This preserves taste and nutritional value until you open the bag. "Happy & Healthy" pellets contain all building blocks for a healthy coat, strong resistance and a long life full of vitality. The adapted cocktail of vitamins, amino acids and minerals ensures the welfare of your animal. Reclosable packaging. Thanks to the zipper closure, you can close the bag again after feeding your pet. This way you save time and the chunks remain crispy. Depending on size, breed and age, an average daily serving of 10 to 15 g is appropriate for a hamster. Goed voer, alles wordt opgegeten door mijn syrische hamster. Giteren besteld vandaag in huis! Super service! Mijn hasters kunnen er weer tegenaan. Ik kwam er ook veel te laat achter dat ik geen voer meer had, maar gelukkig geen probleem want alles was mooi snel in huis. Ik kan dit voer alleen maar aanraden, mijn hamster eet het geweldig goed. Ik ga binnenkort maar eens over op de grotere verpakking denk ik.